Since I was young, I always knew I was adopted from China. My parents had adopted children from different origins: China, Haiti, and indigenous people in Canada. My family has always been open to talking about my adoption, and I met many adoptees in Quebec, where I was raised. Growing up in the only francophone province of Canada, I experienced an invisible wall separating Chinese adoptees and Chinese Canadians. The barrier was mainly linguistic and geographical. It was really hard to communicate with one another because we speak French whereas most Chinese immigrants, living in Chinatown, speak Cantonese or Mandarin, and sometimes English. On one hand, these migrants see us as part of Western society, with white privileges. On the other hand, Quebecers often ask us questions about our origins. “But, I mean, where are really you from?” They would say. When I arrived in China, I also felt like a “banana” – yellow on the outside, but white on the inside. My cultural identity is Western, but my physical appearance is Chinese. I felt like there was still a piece of the puzzle I had to find in order for me to truly understand myself. Before becoming André-Anne Côté, my former name was Chenxinhua or “陈新华,” which means “new nation.” I was born in 1995 in Nanchang, in the province of Jiangxi. I was part of the generation that was supposed to make China rise again, following the era of reform by former party Chairman Deng Xiaoping, who led the country from 1978 to 1989. Instead, I became an object of collateral damage in China’s period of growth: one of many orphans that became a victim of China’s severe family planning policies during the period. My life started with my abandonment. I was left in a basket in front of a market, and struggled against death before I eventually reached an orphanage. I survived and am here now, able to write these lines – but I know very few details about those initial years of my life. Those years seem to me like a blackout. It feels like my life started from an empty hole. 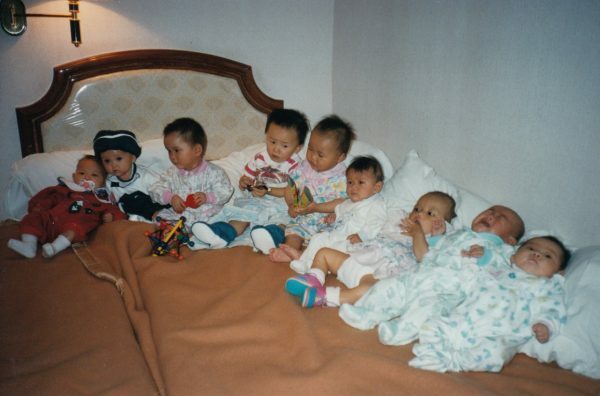 Photo of all the Nanchang children adopted by Quebecer parents taken at a hotel in 1995. Credit: André-Anne Côté. Since 1979, amidst China’s transition towards a system of market economy, the one-child policy produced tens of thousands orphans that were eventually adopted by Western families. I am precisely a product of this political decision – as well as a victim of the traditional preference for boys over girls – that had tremendous repercussions on Chinese society. The preference for men is based on Confucianism, which strongly emphasizes patriarchal family values and devotion to the idea of a male bloodline as one of the central organizing principles of kinship. In 1979, the Party Central Committee imposed the requirement that one couple must only have one child. From 1985-1990, the party relaxed the requirement and introduced the a “one-and-a-half-child policy” stating that for couples in rural areas, a second child is allowed if the first one is a girl. The loosening of the policy continued and in 2013, officials announced that couples with a parent who is an only child are allowed to have a second child. Finally in 2015, they issued the two-child policy, in order to combat the problematic trend of declining fertility and a growing elderly population. Despite these efforts, experts say the recent family planning policies were released too late to effectively increase the fertility rate, and the desire to have children among Chinese couples at present is lower than officials expected. Nowadays, even if the government would abolish the current two-child policy, factors such as challenging living conditions and the cost of education make it hard for the government to reverse the current trend. Through these policies, the government changed the structure of Chinese families and removed an entire generation that represent a pillar of Chinese society – transformations that now have massive repercussions on contemporary China. In retrospect, it is possible for me to see how my biological mom had to abandon me. I was born a girl, which meant that I was a loss for the family; a prospective wife that would have been given to her husband’s family later. Women also had to find a husband to survive, and faced stigma for having illegitimate children. Discrimination was a problem not only for female babies but also for adult women, especially in more traditional rural areas. During this period of strict family planning policies, sonless families would sometimes abandon a daughter in their quest for a son, and daughterless or childless families would adopt abandoned girls to complete their families through domestic adoption. This meant that even if the one-child policy was strongly enforced, parents might use adoption as a means to hide the birth of a daughter, in order to try again to have a son. In response to this, the state decided in 1991 to introduce a law on adoption: prospective adoptive parents should be at least 35 years old and childless. On one hand, the law stipulates that a child is considered an orphan only if his parents can’t be found. On the other, it says that all parents are also responsible for raising their children. Therefore, if a parent provided personal information on the child, they could not abandon the child legally. That is why when I was abandoned, the only information left in my basket was my birth date. That is also why adopted children from China can’t find their biological parents easily unlike adoptees from other countries like Korea, where a parent can give up parental responsibilities while also providing information. Through the years, I became increasingly aware of my identity as an ethnically Chinese and culturally French-Canadian woman, and sought to understand my background. My journey led me to travel to China where I pursued education, learned about my cultural roots, and attempted to search for my family. Certificate of adoption in 1995. Credit: André-Anne Côté. Today is my 23rd birthday. I can clearly remember the first time I came back to China in 2014, right after my 19th birthday. As a young adult reaching maturity, I decided I wanted to learn about my roots. I was about to start college and had a lot of existential questions. I thought that the best way to answer them was to learn Chinese language at the Beijing Language and Culture University (BLCU). It wasn’t my first attempt to learn Putonghua, also known as Mandarin Chinese. My parents made me take Sunday language classes when I was about seven years old, but I didn’t enjoy it at the time. After spending that summer at BLCU, I became fascinated with Chinese society and continued to pursue education in many cities including Beijing, Shanghai, and Taipei. Last year, I started a master’s degree in International Relations at Peking University in Beijing. 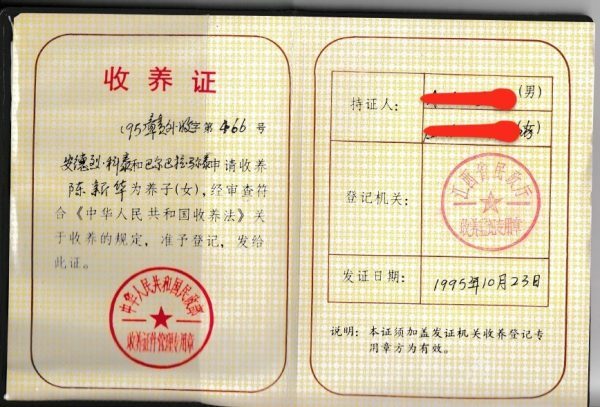 During my courses, I started to develop my identity as a Chinese adoptee, an identity that is unique from that of a Chinese overseas huayi or “华裔,” but still a part of the Chinese diaspora at large. The day after my birthday, I felt I was ready to travel to Nanchang to find my biological parents. After reading many articles about Korean adoptees finding their parents in the newspaper, I spent every effort to find my Chinese parents during the last semester of my studies in Beijing. I contacted several national, local and social media organizations, and used all of the connections I had made across the country. After only three days of circulating my case, I received more than 70 friend requests on WeChat, which is the Chinese equivalent of Facebook. My inbox was filled with messages from people with words of encouragement, perverts, scam artists, and most strikingly – desperate moms searching for their abandoned child. Nevertheless, none of them had details that corresponded to my exact birth date and physical description. At that moment, I felt very naive for hoping to be able to find my real parents in this country of 1.4 billion people. It really felt like searching for a needle in a haystack! Precisely when I was about to give up, a promising family with the correct information contacted me. Only one detail was missing: the father’s photo. Except for this, my boyfriend and I honestly believed this mysterious woman could be my biological mom. We debated and explored the possibilities. We took a direct plane from Beijing to Nanchang. When we arrived at the airport, I was trembling because I had never interacted with my potential biological mom directly. Our first meeting was very beautiful. I learned that I was possibly an illegitimate child from an adventure, and my biological mom cried everyday for many years from the guilt of abandoning her child. On the day of our arrival, we had a traditional welcome lunch and did a maternity test at a DNA center. My biological mom and I promised each other that no matter the scientific confirmation of our blood test, we will always be linked as mother and daughter. During our weekend visit, her whole family – step-dad, sister, brother, aunts, uncles, cousins – received us and treated us like a member of the family. While visiting the beautiful city of Nanchang, I was surrounded by Southern Chinese people who resembled me. I was constantly trying to understand what I would have become if I had stayed in China. The scenarios ran through my mind: a factory worker, a prostitute, etc. I had no souvenirs of Nanchang from when I was five months old, so the visit for me was entirely new, and very symbolic. 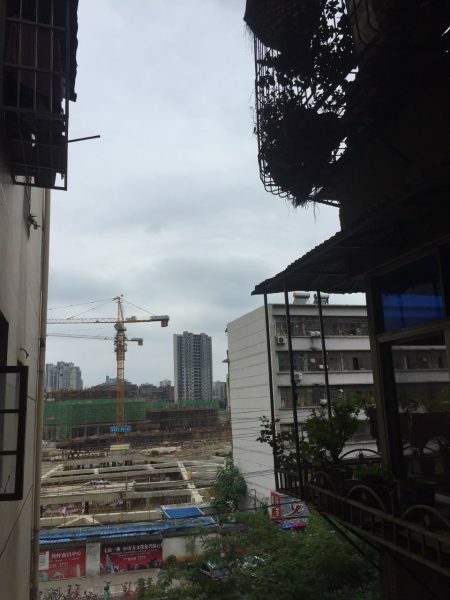 I was able to feel the bustle of the expanding city, which was in the process of demolishing traditional buildings to make room for skyscrapers as part of China’s post-socialist urbanization project. Nanchang has a very unique vibe, with its city parks and public spaces such as the Bayi Square, which is a welcoming location with water fountain shows and spaces for family picnics. Far from the capital, Nanchang people are very pragmatic in their daily lives at work. I really became conscious of the “reversal of luck” that brought about my current life, and felt a humble desire to better embrace my life in Canada. City landscape of Nanchang. Credit: André-Anne Côté. We met the directors of the orphanage. They explained that they are building a new area and that the old section, where I was housed in as a baby, will be destroyed. I saw the new infrastructure surrounding the orphanage as well those inside the building, and they were quite different from my expectations based on the pictures my family took in 1995. I was particularly attentive to the newly built museum, which quoted Chinese leader Xi Jinping at its entrance. Everything was prepared for receiving Western parents willing to adopt other Chinese children. At the end of the tour, the director showed me my details at the orphanage: my official date of birth, arrival at the orphanage, my former name, and other official documentation. But nothing concerning my biological parents. Orphans were given surnames according to the list of the 100 most popular names in China, alternating every year. I received the name of Chenxinhua, “陈新华,” after the district I come from and the name of the state-owned media company Xinhua. They were quite skeptical and offended when they learned that I had tried to use informal channels to find my biological parents. They also didn’t want to let my “sister” enter into the orphanage. I realized that maybe they wanted to protect me from scams, but I also felt like perhaps they didn’t want to let any Chinese citizens visit a state-led orphanage, which was full of children with special needs. The personnel at the orphanage highly suggested I include them in the process of determining whether any of the prospective families who reached out to me corresponded to my birth circumstances. When I was growing up, my parents constantly told me about how they could not leave their hotel in 1995 without an official guide, and that the treatment of foreigners back then was the same as how North Korea treats its visitors now. The experience overall made me feel like they wanted to control the return of Chinese adoptees to their homeland, as well as the voices of birth parents. I was able to interact with some personnel who worked there during the 1990s, particularly one who became the director in the 1980s. She told me that around 20 adoptees come back every year from the United States, Canada, Norway and other European countries. After visiting the orphanage, I felt a huge sense of compassion for the disabled children I met, and I promised myself I will continue to be a part of this cause through volunteering in an orphanage in the suburbs of Beijing. I was also deeply disappointed by the lack of support and social recognition for these children from official institutions. Through this process, I also sadly realized that an entire generation of adoptees will have to rely on informal channels to find their biological parents. Rice cake preparation in the family house. Credit: André-Anne Côté. On the last day of my visit, I had some personal time with my biological mom. She took the time to explain to me her poor living conditions during the 1990s, just after the opening of China’s economy to the world. 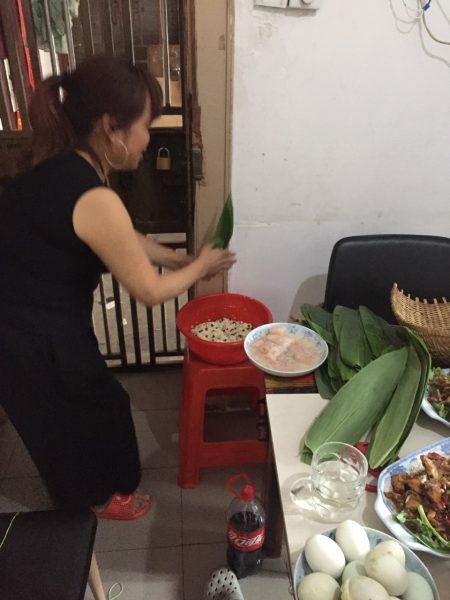 Her grandfather, a member of the Kuomintang party, was categorized as a landlord during the Cultural Revolution, and so her family had to give up all their properties to the Communist Party. Because of this, the next generation of her family could not receive a “danwei,” employment into a unit, or a proper education. So the family opened an independent small restaurant without assistance from the state. She showed me her name on a school list, with the words “anti-revolutionary element” printed next to it. When Deng Xiaoping became leader of the party in 1978, my biological mom still belonged to one of the poorest classes of Chinese society. After the death of her mom, she took care of the family and started working in mining, restaurant, sales and other various sectors. She met my biological dad in a mine, and he lied to her about not having a wife or children. She didn’t want to break up another family. Due to harsh family planning and the death of her mom, her dad decided that the family could not afford to raise a baby, and took it to the supermarket during the night while she was sleeping. After this terrible episode in her life, she had to find a proper husband in her village. Due to her bad reputation, she had no choice but to accept a proposal from a divorced man with a child. Today, she has two children with my stepfather, who has a delicate health situation. For her, being a housewife is the summit of her harsh life. Although we look down on housewives in Canada, I understand that this is the best life she has ever had in the era of prosperity in China, after many years of poverty. Although her entire family suffered, she was able to find a way to become part of the Chinese middle class. Before taking our plane back to Beijing, we had the chance to visit the Bayi Square, built in memory of the Nanchang Uprising against the Kuomintang that took place on August 1st, 1927. This was my last impression of my hometown. I realized that this innocuous city has a thousand year-long history. Through comparing this with Canada, a country with nearly 400 years of history, I was able to understand how my identity has been shaped by both trajectories. I am a product of Chinese economic reforms, as well as Canada multiculturalism. Thanks to this homecoming, I was able to fill a hole in my life: the knowledge of my real origins. In this way, I rewrote the beginning of my life. Far from the nation’s capital of Beijing, my boyfriend and I were plunged into a different side of China. We both previously had several experiences in rural villages, but we never entered so deeply into this realm of Chinese kinship. I learned about the inequalities between urban vs. rural and southern vs. northern China, the application of family law, the use of dialects in conjunction to putonghua, which is the official Chinese language, and the social support that makes up Chinese kinship. I learned that Confucianism is embedded in everyday interactions, and that maternal love is universal. We felt blessed by the amount of love and generosity we received from the family, who before this had never met any foreigners. 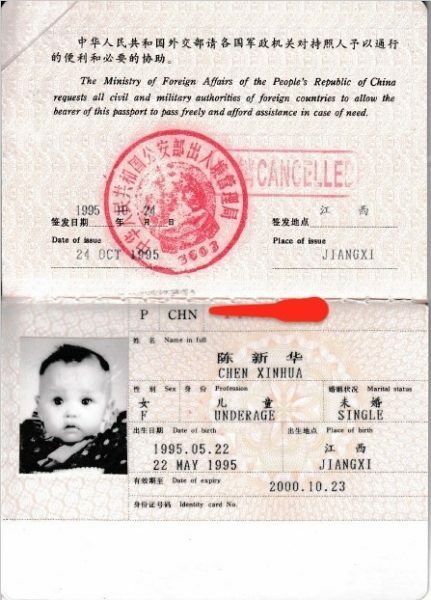 Certificate of adoption in former Chinese passport, 1995. Credit: André-Anne Côté. We finally received the blood test results, and it turns out that this woman is in fact not my biological mother. Yet despite the fact that the same blood does not run between us, I adopted her as my mom, and she adopted me as her daughter. We both need each other to heal from the past and embrace the future. After coming back to my normal life in Beijing, I began reaching out to adoptee organisations in the United States and in Canada. It seems that there is a strong community of Chinese adoptees overseas who wish to build relationships with their former homeland. As China’s power is rising in the international sphere, more individuals are curious to come back to their homeland and discover their roots. What is Chinese identity? On one hand, many young Chinese from abroad are coming back to China to learn about their roots. On the other side, the Chinese diaspora population is also growing. Today, the Chinese constitute the largest group of new immigrants to Canada. Canada’s Chinese diaspora is the sixth largest, numbering about 1,800,000, making up multiple waves of immigration. In the future, I believe more research needs to be done about the role and voices of adoptees in the Chinese diaspora, in contrast to that of second generation Chinese Canadians and mixed Chinese children. Although there is still an invisible wall between the Chinese Canadian community and Chinese adoptees, I think adoptees form a unique group. Within every one of us there is an intricate and essential story…and many of us are just beginning to discover it. Portrait of the author. Credit: André-Anne Côté. André-Anne Côté is a culturally French-Canadian Chinese adoptee who was raised in Quebec, Canada. An M.A. 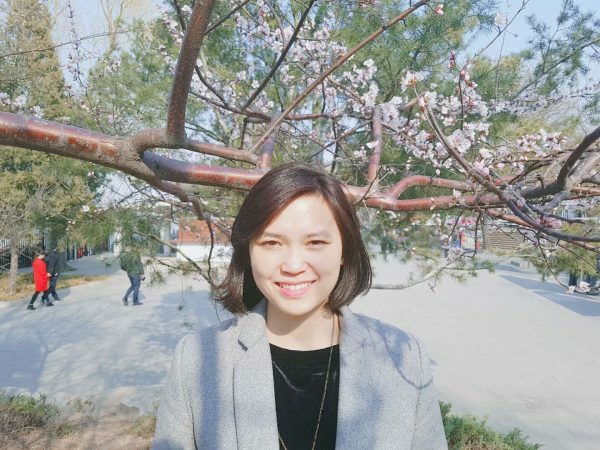 Candidate in International Relations at Peking University, she holds a B.S. in Anthropology from Laval University. Find her on Weibo, and Instagram.